Somali Pirates Reportedly Seize Tanker In First Commercial Hijacking Since 2012 : The Two-Way An anti-piracy group says the Aris 13 oil tanker, which has an eight-member Sri Lankan crew, sent a distress call Monday and "then it disappeared." The Somali coast, as seen from an airplane nearing the airport in Mogadishu in 2015. An oil tanker with eight Sri Lankan crew members aboard appears to have been hijacked off the coast of Somalia, which would be the first time a large commercial ship has been taken by Somali pirates since 2012. The Aris 13 sent a distress call Monday saying it was being tailed by two unfamiliar ships, "then it disappeared," John Steed of Oceans Beyond Piracy, an anti-piracy group, tells Reuters. 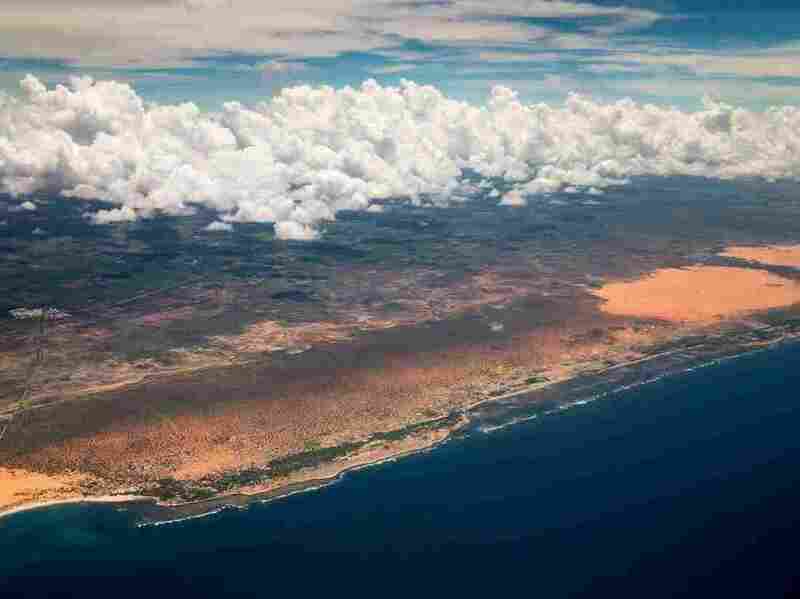 The news service reports that the tanker, which had been transporting fuel from Djibouti to Mogadishu, Somalia's capital, turned off its tracking system and diverted toward the small town of Alula. "The men who are holding it claim that they are fishermen who suffered from the illegal fishing in the area," Ali Shire Mohamud Osman, the district commissioner in the town of Alula, tells the BBC. "However, if we confirm that they are pirates, I will ask them to leave the area immediately. Otherwise, we will see how we can save the vessel." The European Union Naval Force, which runs anti-piracy operations in the area, tells media outlets it is too early to confirm whether pirates are behind the disappearance of the ship, which had an eight-member Sri Lankan crew, according to the country's ministry of foreign affairs. If indeed pirates are involved in the incident, Reuters reports it would be the first time pirates "have successfully taken a commercial ship since 2012," noting that at their peak, from 2009 through 2011, Somali pirates were attempting more than 200 attacks on vessels a year. The BBC says that in 2011, the annual cost of piracy was estimated at $8 billion. Patrol efforts by the EU NAVFOR, as well as bolstered security efforts on merchant ships themselves, have been credited with the stark drop in piracy in the region since then. Yet all has not been well off the coast of Somalia. Many Somali fishermen — including former pirates — have lodged complaints that foreigners have been shouldering in on their livelihoods by illegally fishing in local waters, according to The Associated Press. "They have been sailing through the ocean in search for a foreign ship to hijack since yesterday morning and found this ship and boarded it."